I wrote an article a while ago about how KDE was being removed as an official flavour of Linux Mint past 18.3, and so I thought perhaps a quick review of 18.3 KDE was in order. Linux Mint 18.3 KDE is based on Ubuntu 16.06 LTS. If you’ve ever installed Linux Mint, Ubuntu, Manjaro, OpenSUSE or nearly any other distro, you’ll have no issues installing Linux Mint 18.3 KDE. I had no problems with the installer, went smooth and clean, took little time to install. Nothing really worth phoning home about. Linux Mint 18.3 KDE comes with the usual set of applications you have grown accustomed to with KDE, such as Dolphin, Kate, Konversation, Kmail, etc. Dolphin is still the most epic file manager I have come across in the GNU/Linux world. Running KDE Plasma 5.8.8 LTS, a full changelog of 5.8.8 can be viewed here. I am happy to see that just with Cinnamon, the KDE flavour of 18.3 comes with Timeshift, and also Redshift, an application that changes the colouring / tinting of your screen at night to reduce eye damage from bright blue lights by shifting into slighty redder hues. Overall, the KDE flavour is packed with the usual programs like Amarok, VLC, GIMP, LibreOffice, etc. This is where I was the most surprised and happy with my Mint KDE setup; the performance on the laptop I installed to, was absolutely stellar. KDE is known to be a little heavier and more sluggish than some of the other environments, but it ran smooth as butter, very few slowdowns or hiccups, applications opened in a timely fashion... I was seriously impressed with how fast the system performed. There was one issue that I found, but was able to slightly mitigate: Running dual screens, I frequently (not always, was program dependent) had windows open on my secondary monitor (laptop) rather than my primary (TV), which was annoying as hell let me tell you. Setting primary monitor -should- have fixed it, but did not. This is a problem with KDE that dates back years, to KDE 4. To mitigate this issue, I went to “System Settings” “Window Management” “Advanced” and then changed ‘placement’ from “Smart” to “Under Mouse.” This opens new windows, under the mouse, which usually is on the primary screen, since thats where my programs menu is. I’d say this fixes the issue 98% of the time except in rare circumstances; but this is still an issue that needs to be fixed by the KDE team. Now you: Do you use KDE? On which Distro? Tell us your thoughts! I wrote an article a while ago about how KDE was being removed as an official flavour of Linux Mint past 18.3, and so I thought perhaps a quick review of 18.3 KDE was in order. KDE is the best. I’ve tried others but always come back to KDE. KDE in Linux Mint is somehow slow and buggy, I guess it’s not compatible with Linux Mint? I ended up using Kubuntu now. I agree. KDE is not without it’s problems (what is? ), but of all the desktops that I’ve tried (which is most of them), I keep coming back to KDE. The ability to choose whichever desktop you prefer is one of the great advantages of Linux, in my opinion. I have Mint 17.3 Cinnamon (didn’t upgrade to 18 as I don’t like fixing what isn’t broken). For me personally, Cinnamon is fine and I must say, I never understood why there was a Mint KDE option, too. What exactly was the point? I could say the same thing about Linux Mint MATE and Linux Mint Xfce so pointing out Linux Mint KDE as the only redundant version is a bit selective. Did Redshift adjust the color on both your monitors out of the box? I’ve managed to get it working on the Primary monitor, but not on the secondary. does it have the same tearing problems with nvidia that other distros with kde have? It’s my favorite environment, but I’m switching to cinnamon because of the tearing and framerate issues. I’ll be back the second they’re resolved. I run KDE neon. It is also based on Ubuntu 16.04 LTS, but is running the current 5.12.1. It receives KDE Plasma updates continuously, so new desktop features are always there. It installs as a bare-bones distro with no bloat. I install what I need manually after that. I prefer this bloat-free install. Performance is great and KDE features are state-of-the-art. 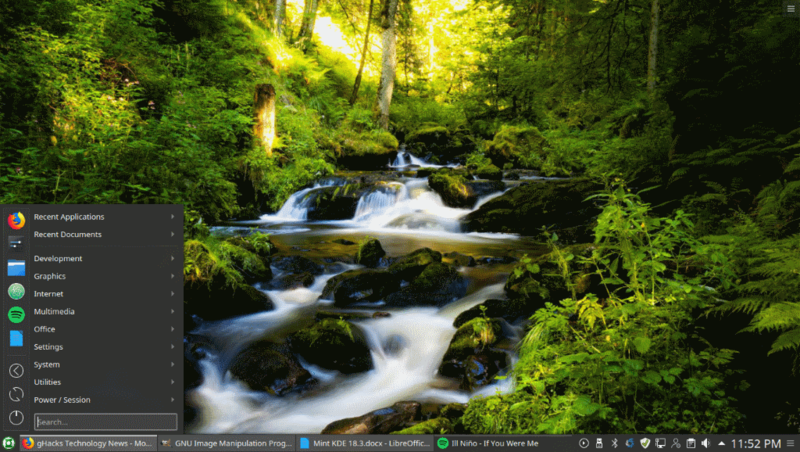 This is where Mint users should go after Mint 19 abandons the Plasma desktop. I love the plasma DE. Linux Mint worked best out the box, installation of other software was easier (Discover would continually freeze in the other distro’s – now just crashes on updates) and is rock solid stable. I’ve been using KDE since mid 2016, with Linux Mint 17.3 (Plasma 4), some time in early 2018 with LM18.2 (Plasma 5) and more recently (mid 2018) Manjaro KDE. I currently run the latter two with the LM17.3 HDD kept for archival purposes. For me it’s the best; Dolphin, Kate, Konsole etc. blowing the GTK equivalents out of the water. K3b, Kdenlive etc. are also fantastic and integrate better with KDE than other DEs. I do also use other DEs (not on the same system!) inc. Cinnamon and Xfce. I find KDE to be very responsive even with 2GB of RAM. I intend to run later versions of Mint with KDE; either upgrade from LM18.3 or install LM19.x Xfce & replace the desktop environment accordingly. Might post a follow-up here with the results. It’ll be interesting to see how the performance of LM18.3 KDE compares with that of Manjaro KDE, when tested on the same hardware.